My calendar this morning reminded me that today was the 33rd year since my grandmother Pauline passed away and even though there is nothing significant about the number 33, it’s the first one of those anniversaries to come by since I started writing my blog and therefore, the perfect time to put down some thoughts about her and some remembrances while a few are still in my head. When I think about it, I wonder how more than three decades could have gone by since she last graced the lives of my family and the lives of so many other people too. Her death was the first true loss that I ever had to deal with and understanding it and putting it behind me took some time afterwards because that first time you realize that people are not forever, it can really stop you in your tracks. I only had her in my life for twelve years, almost as long as I have been married and that time went by very quickly so in the scheme of things, she was only with me for a very short time. Add to that the fact that when you do the math, I saw her maybe an average of 21 days a year and you begin to wonder how you can become so attached to someone that you only saw an estimated total of 252 days of your entire life-but I did get attached to her and I missed her terribly when she left and I still miss her today for other reasons. She never had the robust health of some of her sisters, yet she worked tirelessly as long as she was able to until her health began to fail and took her away from the teaching of children that she loved so much. She was the example of what being a “Preacher’s Wife” meant during the time she was one, always supporting the ministry of my grandfather, always visiting the sick and the poor, always doing something thoughtful and nice for others, all while teaching school and raising two children. I came to realize that while to some, this was seen as an obligation of being married to the minister-but in reality, this was a calling to her and doing things for others that brought them happiness made her very happy. I don’t think she would have been any different had she never married my grandfather; it was just who she was. It never occurred to me that when I used to go to visit them that she had other things to do while I was there because she managed to do what needed doing while simultaneously making sure I felt like the center of her attention. Most of the time, she incorporated my visits into her rounds and routines and I would help deliver things to those she went to see. Usually they were elderly widows and shut-ins but sometimes trips to the hospital to see people of all ages were necessary. She was always cheerful and upbeat and her visits were special to people. For me, there were certain traditions about going to their homes. 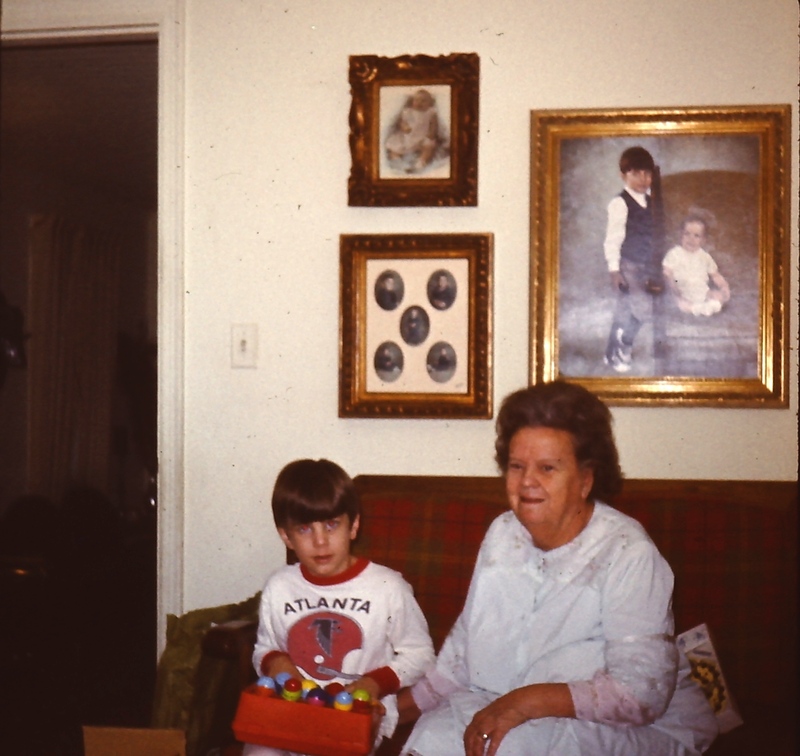 I thought it was cool that they moved to a new home every few years, that my grandfather worked for God and that my grandmother seemed to like going to the dime store a lot to get me a new toy each time I came up. She was a superb cook within a limited range of menus and I used to enjoy watching her scramble eggs for breakfast, marveling that the egg beater could move so fast in her hand and never spill a drop. Even more amazing was that all the things she liked to cook just happened to be all the things I liked to eat… fried chicken, mashed potatoes and biscuits made from scratch come to mind. Dessert was usually a bowl of some of the best banana pudding that I have ever had. She also baked cupcakes, loaded with homemade icing and coated with sprinkles. There was always something good baking in her kitchen. when he stands, he sits almost. When he hops, he flies almost. And when stands, he sits on what he ain’t got almost. If she wasn’t cooking and baking, she was making decorative things for people out of unlikely things like egg cartons and pipe cleaners (obviously being a schoolteacher had sharpened her craft skills). While she was still teaching, she liked to make craft projects to give to her students to do and she could always come up with something fun to make. Of course, the teacher in her also had to make sure that her grandson didn’t forget how to do his schoolwork while out on break and visiting. She bought one of those pads, the kind kids like to play with, where you write on the plastic “page” with a stick shaped like a pencil and black carbon underneath made it look like ink on a page. When you finished, you just lifted the plastic page up and the writing disappeared like magic. On this, she would write math problems for me to do and words to complete the spelling on. She could be relentless as a teacher but as a grandmother, she was always loving, kind and fun to be around. She died just a few years later from a blood disorder that eventually turned into leukemia. I remember that the day of her funeral was bitter cold, even by February standards, but the sun was shining brightly as we entered the church in Jefferson, Georgia where she and my grandfather had retired to. The funeral was typical and three pastors, one of which was destined to become a Bishop, conducted her services. Her favorite hymns were played and moving statements made about her life and the impact she had on other people. I didn’t need to hear that to know the truth in those statements because the evidence of that was in the church-people everywhere, from all over, from towns she had lived and taught in….Atlanta, Augusta, Rome, Clarkdale, Hickory Flat, Jackson and everywhere in between. People stood outside in temperatures below freezing to be there for her that day and when the funeral procession left for the 35 mile drive to Cornelia, almost every person went too. I remember a deputy telling my father that the procession was over two miles long, one of the longest he had ever seen. Each of these people had been touched in some way by her, each had stories to tell and each was a testimony to her ministry and to her life. She set an example of living her life in service to others who were less fortunate and who needed someone to give them a little boost. A life well spent and a life worth remembering. While I remember the cupcakes and the crafts and the gifts, it’s the example she set that is the most important and while the lessons she taught on that little eraser pad were important in her mind, the ones she taught by example are the ones I will always remember her the most for. This is the sweetest memorial – definitely shed a few tears. You were so lucky to have her in your life. Thank you for sharing this. It’s so neat to learn all of those things about my great grandmother!